When Winston Carl, left with husband Jack, first took over her duties for the Krewe Ball there were no answering machines, no home printers or copiers, no caller ID, no computers and no email. Carl prided her husband, now a retired judge, on his ability to cooperate with the madness. Photos special to the Journal. Winston Carl of Mountain Brook can recall nearly the entire history of Birmingham’s Beaux Arts Krewe, because her mother was there for its beginning and then passed along her position to Carl. 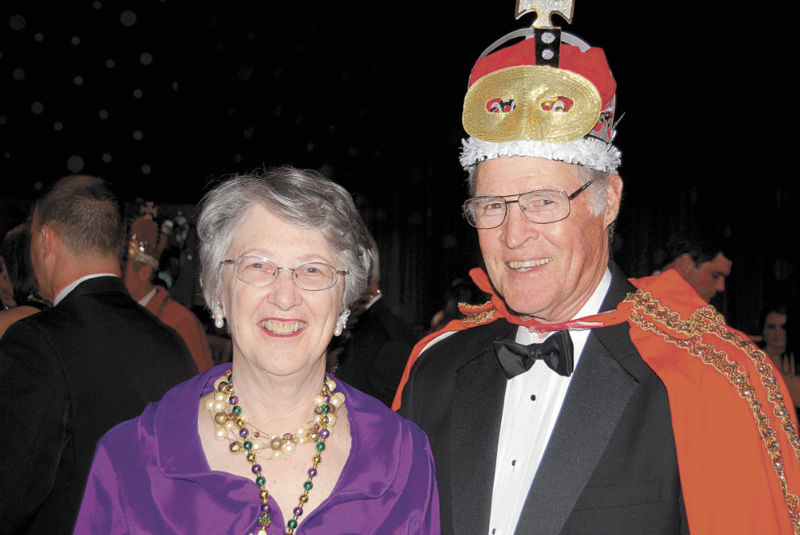 After holding the slightly undefinable job of corresponding secretary/liaison between the ball’s king and queen, Carl is retiring from the volunteer position she has held since 1984. “I usually say that my role is corresponding secretary, but my main job is to tell people that they are having fun,” Carl joked. For the Krewe’s first debutante ball, in 1966, Beaux Arts Krewe founder Anne Kidd called on Carl’s mother, Sallye Martin, to address invitations and pair each princess with a date. The purpose of both the Krewe and the production were to provide continuing support to the Birmingham Museum of Art. Over time, Martin’s responsibilities grew, and as her health began declining in the early 1980s, Carl began actively learning exactly what her mother’s job was. “In 1983, my mother told me I had done the Krewe, but when she died in October 1983, I found out, even though she was sick, she had done most of the work,” Carl said. Looking back on her early years in the position, she said she is always baffled at how she got anything done. When she first started, there were no answering machines, no home printers or copiers, no caller ID, no computers and no email. Almost everything had to be done by hand and through personal contact, save taking things to the Quick Kopy on Green Springs. Calls came in at all hours and Carl prided her husband, now-retired Judge Jack Carl, on his ability to cooperate with the madness. “During those times I just never answered the phone,” Jack Carl said. “I knew that it could only go one of four ways.” With only one of the four potential outcomes being a message relayed to his wife successfully, he showed his support, instead, by cheering her on from the sidelines so as not to get in her way. Of the many competing descriptions of her job, the one central aim is to aid the Krewe captain. Carl said he does the bulk of the logistical work, while Deborah Fleischman serves as the visionary behind the production, designing the decorations and drawing costumes for the Krewe’s seamstress extraordinaire, Jo Dickinson, to create for the children who serve as pages. Because the queen is in her early 20s and the king is a longtime Krewe member, Carl said, the key challenge is getting the two to be comfortable around each other so they can enjoy the experience. It’s spending time with and getting to know these people that Carl said was the most rewarding thing about her job and the reason she enjoyed it so much. Some of her favorite stories are of the children who act as ball pages and train bearers. Carl looks back on even the more trying moments of the job with amusement. One of her smaller responsibilities each year is to pick up the queen’s 60-pound train from storage at the museum. One year when the museum was being renovated, Carl was told that the portion of the building where the train was stored was about to be closed off and would be closed on the date of the ball. “I made it to the museum just days before they sealed that part of the building,” Carl said. The train was saved, but that also meant she had to store a priceless 60-pound train for a few months. Though she said she will miss the fun she had behind the scenes, Carl is nothing but excited about this year’s ball. Taking over her old job is Elon Allen, in whom Carl places her complete confidence. For the Krewe’s annual fall dinner, Carl was asked to speak about her history with the ball, so she finally compiled a list of her general responsibilities. Among them were: communicating information to the Krewe members and presentees, collecting any forms and dues, compiling lists, sending reminders, answering just about any question and, most importantly, telling the king and queen how much fun they are having. “And always, I did this with a great deal of joy and happiness and received back more than I gave,” Carl said.